As the prices of cryptocurrencies continue to fall throughout this current bear market, it’s interesting to observe the one thing that has risen during this time. At the height of the cryptocurrency ICO bubble in December last year, the Bitcoin Dominance Index touched a low of 32%. Since then the index has steadily risen to 48% and continues to approach the 50% level. So what is the Bitcoin Dominance Index, and why is it relevant? Simply put, the Bitcoin Dominance Index measures the market capitalisation of Bitcoin compared to the overall capitalisation of all cryptocurrencies. In other words, it’s an indicator of the size of the Bitcoin market relative to the cryptocurrency market at a whole. What is the relevance of such an index? As outlined in previous articles, Bitcoin is unlike all other cryptocurrencies due to its unique properties of complete decentralisation, immutability and censorship resistance. It’s also unlike any other crypto due to the way it was anonymously created and has evolved as a grass roots phenomenon. Therefore, it’s interesting to monitor the index to gauge the store of value characteristic which Bitcoin offers holders of altcoins. It’s important to understand that the Bitcoin Dominance Index is not an accurate measure by any means, and must be viewed as an informal guide. The index is an imprecise measure for a couple of reasons. Firstly, it does not take into consideration the illiquidity of many cryptocurrencies. The vast majority of altcoins have shallow market depths, meaning that they can’t be traded in significant size without their prices fluctuating massively. The index only calculates the value of an altcoin’s last recorded trading price, and uses this price in determining its market capitalisation relative to Bitcoin. Secondly, new cryptocurrencies are created and launched on exchanges weekly, which dilutes the dominance Bitcoin has on the overall market. Perhaps measuring Bitcoin’s dominance in relation to a basket of larger cryptocurrencies with deep order books would be a more accurate barometer of Bitcoin’s superiority over the market. 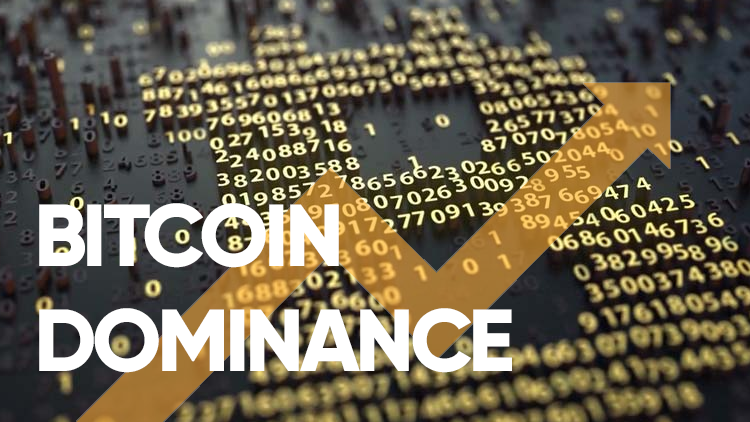 However, the index includes all coins in the crypto ecosystem, which decreases Bitcoin’s dominance as new ICOs come onto the market. Further still, it’s said that cryptocurrencies never really die, so altcoins which are for all practical purposes dead can still be counted into the dominance index. For example, the index still factors into its calculations the price of the Ponzi scheme scam coin Bitconnect (BCC). Surprisingly, months after its collapse, Bitconnect tokens are still trading on some exchanges, resulting in its market capitalisation still being included in the Dominance Index. Even with the points above which outline the bias against Bitcoin, it’s remarkable that Bitcoin’s dominance over all other cryptocurrencies still continues to rise during this crypto bear market. This rise in dominance can most likely be attributed to Bitcoin’s unofficial role as the ‘world’s reserve cryptocurrency’. Bitcoin offers utility, functionality and the most liquid market of any cryptocurrency, therefore what’s most likely happening in the crypto space is a flight to safety out of high risk altcoins into the ‘store of value’ properties of Bitcoin. During a crypto bull market, hot money enters the crypto ecosystem and chases the allure of massive returns offered by the latest ICO. The fear of missing out rules over the principles of value investing and common sense. This in turn lowers the Bitcoin dominance as the hot money is deployed into riskier and more speculative investments. On the flip side, during a crypto bear market, investors and speculators rethink their actions and move capital towards safety. So although the Bitcoin Dominance Index isn’t a true reflection of the crypto market, it can be used as a fun barometer to whimsically measure the amount of speculative money trading in the market.